create, sign and store all your documents at one, safe place. 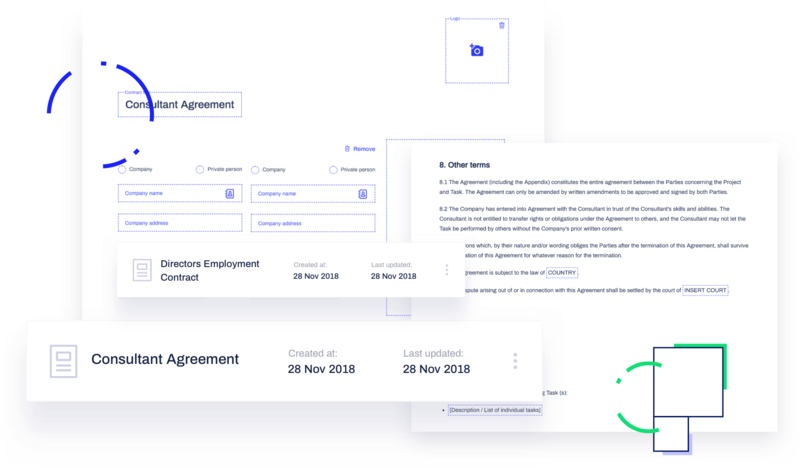 Choose one of our free contract templates, get one from your lawyer or create your own, customised templates from scratch - directly on the platform! Get rid of your printer and sign your contracts digitally on the platform. You can either use our legally binding two-factor authentication or National IDs such as the Danish NemID. Upload your old documents and store them with the new to keep everything securely stored and organised in the cloud. You always can access your legal documents and archive them in a GDPR-friendly dataflow which is easy to manage. Contractbook enables you to manage the contract from A to Z; from negotiation and drafting, to signing, sharing and storing. Contractbook Suits is a client-centric tool for legal professionals. Monitor and manage your client's legal documents. Automate your workflow with our scalable API-integrations or connect Contractbook with more than 1500 other apps through Zapier.